Presentation given at the CCS System Integration Workshop, Calgary, Canada on 19-20 September 2012. ZEP is an advisor to the European Union on the research demonstration and deployment of CCS. The ZEP’s Taskforce Technology has undertaken a study into the costs of complete CCS value chains – i.e. the capture, transport and storage of CO2 – estimated for new-build coal- and natural gas-fired power plants, located at a generic site in Northern Europe from the early 2020s. Utilising new, in-house data provided by ZEP member organisations, it establishes a reference point for the costs of CCS, based on a 'snapshot' in time (all investment costs are referenced to the second quarter of 2009). Three Working Groups were tasked with analysing the costs related to CO2 capture, CO2 transport and CO2 storage respectively. The resulting integrated CCS value chains, based on these three individual reports, are presented in this summary report. For a complete picture of how the results were obtained, and all underlying assumptions, please refer to the three individual reports. 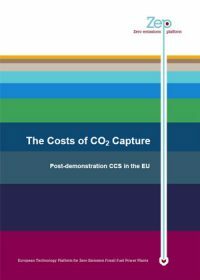 The EU CCS demonstration programme will not only validate and prove the costs of CCS technologies, but form the basis for future cost reductions, enhanced by the introduction of second- and third-generation technologies. 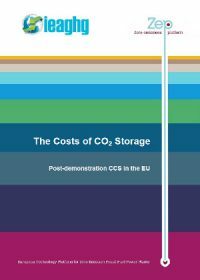 The results of the study therefore indicate that post-demonstration CCS will be cost competitive with other low-carbon energy technologies as a reliable source of low-carbon power. CCS is on track to become one of the key technologies for combating climate change – within a portfolio of technologies, including greater energy efficiency and renewable energy. CCS can technically be applied to both coal- and natural gas-fired power plants. Their relative economics depend on power plant cost levels, fuel prices and market positioning, whereas applicability is mainly determined by load regime. The study includes the three main capture technologies (post-combustion, pre-combustion and oxy-fuel), but excludes second-generation technologies (e.g. chemical looping, advanced gas turbine cycles). Using agreed assumptions and the Levelised Cost of Electricity as the main quantitative value, there is currently no clear difference between any of the capture technologies and all could be competitive in the future once successfully demonstrated. The main factors influencing total costs are fuel and investment costs. Clustering plants to a transport network can achieve significant economies of scale – in both CO2 transport and CO2 storage in larger reservoirs, on- and offshore. Large-scale CCS therefore requires the development of a transport infrastructure on a scale matched only by that of the current hydrocarbon infrastructure. As this will lead to greatly reduced long-term costs, early strategic planning is vital – including the development of clusters and over-sized pipelines – with any cross-border restrictions removed. Location and type of storage site, reservoir capacity and quality are the main determinants for the costs of CO2 storage: onshore is cheaper than offshore; depleted oil and gas fields (DOGF) are cheaper than deep saline aquifers (SA); larger reservoirs are cheaper than smaller ones; high injectivity is cheaper than poor injectivity. Given the large variation in storage costs (up to a factor of 10) and the risk of investing in the exploration of SA that are ultimately found to be unsuitable, a risk-reward mechanism is needed to realise their significant potential and ensure sufficient storage capacity is available – in the time frame needed. Based on current trajectories, the price of Emission Unit Allowances (EUAs) under the EU Emissions Trading System will not, initially, be a sufficient driver for investment after the first generation of CCS demonstration projects is built (2015-2020). Enabling policies are therefore required in the intermediate period – after the technology is commercially proven, but before the EUA price has increased sufficiently to allow full commercial operation. The goal: to make new-build power generation with CCS more attractive to investors than without it. 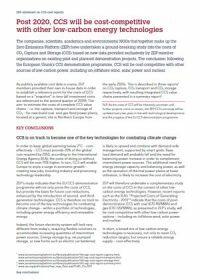 The companies, scientists, academics and environmental NGOs that together make up the Zero Emissions Platform (ZEP) have undertaken a ground-breaking study into the costs of CCS based on new data provided exclusively by ZEP member organisations on existing pilot and planned demonstration projects. Costs for different CCS options were determined using data for postcombustion, pre-combustion and oxy-fuel capture technologies, pipeline and shipping transport and storage in on and offshore depleted oil and gas fields and deep saline aquifers. This report summarises the key conclusions of the study. The companies, scientists, academics and environmental NGOs that together make up the Zero Emissions Platform (ZEP) have undertaken a ground-breaking study into the costs of CO2 capture based on new data provided exclusively by ZEP member organisations on existing pilot and planned demonstration projects. 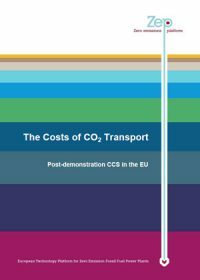 This report describe costs associated with the capture process and the conditioning and compression/liquefaction of the captured CO2 required for transport. The technologies studied are first-generation capture technologies, namely post-combustion CO2 capture, IGCC with pre-combustion capture and oxy-fuel for hard coal, lignite and natural gas. The companies, scientists, academics and environmental NGOs that together make up the Zero Emissions Platform (ZEP) have undertaken a ground-breaking study into the costs of CO2 transport based on new data provided exclusively by ZEP member organisations on existing pilot and planned demonstration projects. This report describes three methods of transportation namely onshore pipeline transport, offshore pipeline transport and ship transport.This report presents detailed cost elements and key cost drivers for each transport method. The companies, scientists, academics and environmental NGOs that together make up the Zero Emissions Platform (ZEP) have undertaken a ground-breaking study into the costs of CO2 storage based on new data provided exclusively by ZEP member organisations on existing pilot and planned demonstration projects. This report describes the bottom-up approach taken using cost components provided by ZEP members. In order to cover the range of potential storage configurations and still provide reliable cost estimates, storage was divided into six main typical cases, according to major differentiating elements. Including depleted oil and gas fields (DOGF) vs. deep saline aquifers (SA), offshore vs. onshore, and whether existing wells were re-usable. How can the project network best contribute to CCS in 2010-2012? Zep presentation on future ideas for the Network at the 1st Advisory forum.